The number of distracted drivers, including near school zones, is spiking in the Washington, D.C.-region, according to a review of police and motor vehicle records by the News4 I-Team. Police citations for distracted driving and the number of crashes in which cellphone distractions were a factor have soared in the past year, according to the records obtained under the Freedom of Information Act. The increase is troubling to law enforcement officials, safety groups and traffic engineers. “It's universal. Distraction is a very serious issue. The crash rate and fatality rate have increased in past few years,” said Tom Dingus, director of the Virginia Tech Transportation Institute, which studies the impact and risks of driver distraction. "Distraction is a big component in that increase." The I-Team’s review of Maryland State Police records show citations and warnings for distracted driving jumped from 17,718 during the first half of 2016 to 20,762 in the first half of 2017. In Montgomery County, police records show more than 10,000 citations and and warnings for distracted driving since January 2016. The I-Team review found almost 1,400 of those violations occurred in school zones, within a quarter mile of public school buildings. “It is imperative that drivers pay extra attention and drive without distractions when they are within a quarter mile of a school because our children frequent these areas and we are counting on drivers to look out for them since our children sometimes act unpredictability,” Montgomery County Police Capt. Thomas Didone said. 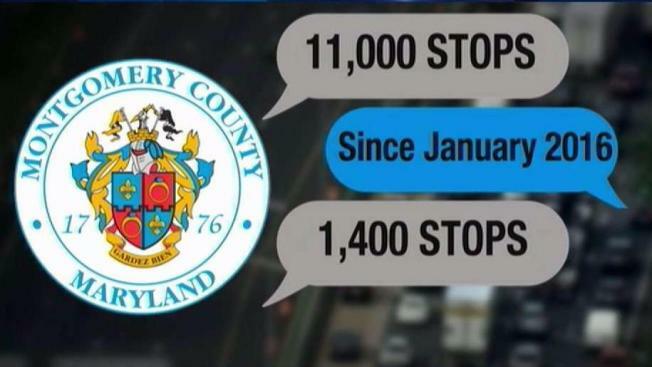 Fairfax County Police Department records show more than 1,200 crashes since 2014 in which distraction was a factor. “It’s getting worse. Absolutely worse,” Maryland Transportation Authority Police Department Officer Howard Burnett said. “We have a lot of single vehicle crashes for that reason,” Burnett said. The increasing prevalence and sophistication of phone apps risks fueling the problem of distraction, Dingus said. “I see it everywhere and also by the schools, which makes me very concerned,” said Adiva Sotzsky, whose husband was killed in a distracted driving crash in 2004. “Not only do we have the drivers distracted, (the kids) are busy with the cellphone or texting. We have the walkers, walking with the cellphones, not paying attention," Sotzsky said.